My father Stanley Gardner is on this photograph (front row on the left) but just when he and his fellow employees of Boneham & Turners went down Clipstone Pit remains a mystery. The above picture reminds me of a story that my late Brother-in-Law, Allan Allsop once told me. He had spent most of his life in the mines, rising to Pit Manager, and continued working for the people who took over the pits when many had closed.I guess there will be a few ex-miners who will remember Allan. 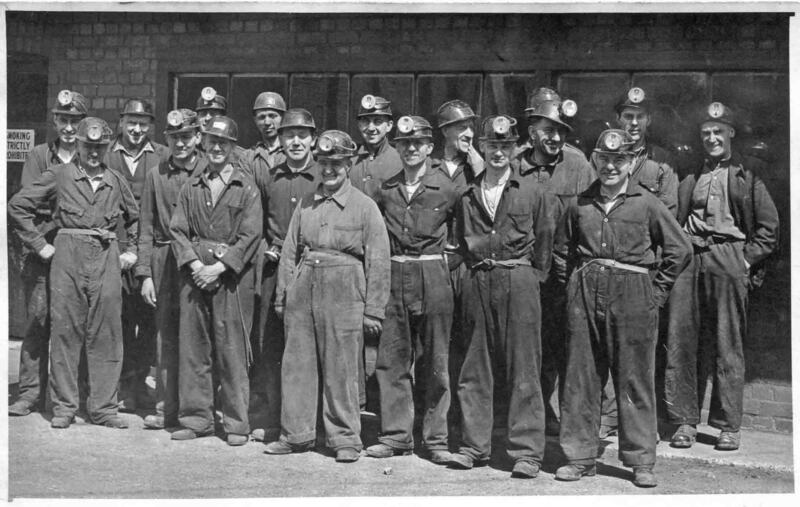 It was one day when Allan had to visit his family Doctor, during which in conversation , the Doctor said , ” Do you know Allan, I get a lot of miners come in here, surely working down the pit can’t be that bad “. To which Allan replied, ” Would you like to have a look down a pit ?”. “Yes ” replied the Doctor. So Allan made arrangements for the Doctor to accompany him going down the pit.When the cage reached the bottom of the shaft, the Doctor looked around, and without dismounting from the Cage said, ” Take me back up Allan “, ” I’ve seen enough “….